The Navy – Marine Corps Memorial Stadium, located in Annapolis, Maryland, is a 34,000-seat state-of-the-art sports facility that serves as the home field of the Navy Midshipmen football team, the men's lacrosse team, and the Chesapeake Bayhawks lacrosse team. The stadium was built in 1959 at a cost of $3 million and is operated by the Naval Academy Sports Association. 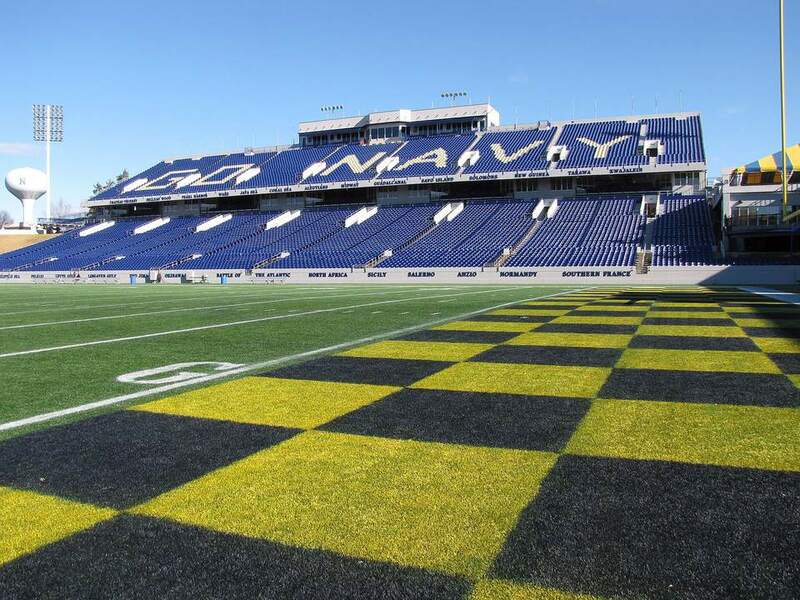 In addition to the Navy sporting events, the stadium and its grounds are used year-round for a wide-range of events such as the Annapolis 10 Miler, Annapolis Rotary Crab Feast, US Bands High School Marching Band Competition, the Annapolis Arts & Crafts Festival and the Military Bowl. A variety of banquet facilities are open to the public. In 2004, the stadium underwent a $40 million renovation with improvements including the addition of two video scoreboards, luxury suites, new stadium seating, updated restrooms, concessions and stadium operation facilities, new banquet facilities, and renovated locker room facilities. The grass field was replaced with 90,000 square feet of synthetic turf. The Navy – Marine Corps Memorial Stadium serves as a memorial to the Navy and Marine Corps of the United States. Hundreds of memorial plaques are featured on the Memorial Plaque Wall in the North Memorial Plaza and more than 8,000 chair back memorial plates are located throughout the stadium. Battle arches and class arches serve as the entranceway to the stadium and tell the history of the Navy and the Marine Corps. Each battle fought by either the Navy or Marine Corps is depicted through the use of color-coded battle streamers allowing visitors to chronologically view the story of the brave men and women who have served our country. When the stadium was renovated, the memorial features were beautifully preserved and are a “must see” when attending a game or special event. Open Monday – Friday, 9 a.m.-4:30 p.m. The Navy – Marine Corps Memorial Stadium is located about 1.5 miles from the United States Naval Academy and the Annapolis waterfront. The address is 550 Taylor Ave, Annapolis, MD. Directions: From U.S. Route 50 East: take exit 24 Rowe Blvd, From U.S. Route 50 West: take exit 24A Rowe Blvd. Turn right on to Taylor Ave. The stadium will be on the right. Use Gate 5 for USNA Shuttle parking. Parking: All parking passes for Navy Football are pre-sold. Parking costs $5 per vehicle. The stadium parking lot opens at 9 a.m. for each home game and closes three hours after the end of the game. A season- parking pass is available for $100 and guarantees a spot in the parking lot. Limited handicap parking is accessible through Parking Gates 2, 5, and 6. Offsite parking is available on game days from the Harry S. Truman Park & Ride with a free shuttle service and at the Germantown Elementary School, located on the corner of Cedar Park Drive and Glenn Ave. The parking lot opens at 10 a.m. and costs $20 per vehicle. Walking Directions from the Stadium to USNA: Head east on Taylor Ave., Cross Rowe Blvd. and turn right on Annapolis St./ Rte. 450. Cross King George St. and USNA Gate 8 will be ahead on the right. The originating point of shuttle bus service to the USNA on Navy football home game days varies. Service begins one hour prior to the start of the first sporting event of the day and runs until one hour past the end of the game. Parking costs $5 per vehicle. The shuttle bus is free. The USNA shuttle bus picks up and drops off at the west parking lot at Navy-Marine Corps Memorial Stadium, in front of the Blue Angels plane. The shuttle bus will run from this location EXCEPT on days of Navy home football games. VIP Suites – A variety of stadium suites are available to rent featuring indoor or outdoor options with views of the field, air conditioning, private restrooms, sink, and built-in televisions. All suites are rented for the entire season for home games. The VADM William P. Lawrence "N" Room - The 8,500 square foot banquet hall is designed to accommodate large banquets, formal dinners, and business meetings. The hall can be divided into 3 sections to accommodate smaller parties. The Bilderback-Moore Navy Lacrosse Hall of Fame Room - The room is over 3,000 square feet and includes a memorial of Navy Lacrosse photos, trophies, display cases, and memorabilia. Located on the second floor of the "stadium tower" with access to two adjacent outdoor tenting areas, the space offers a unique venue for private events. Stadium Terrace Level Venues – Several outdoor tented areas overlook the field and are available for BBQs and receptions. The tents can accommodate from 250 to 600 people. In addition, the Blue and Gold side concourse areas offer large areas for a wide range of events. Historic Annapolis is just 1.5 miles away and has a wide selection of places to dine. The following restaurants are within a half mile walk from the stadium.